“Rcx ripping in the streets of LA”… well not quite yet. So after trying the old Gianelli pipe with a shorter length I was able to hit the 12,000 rpm zone way higher than the first time I started the bike with the Bidalot pipe. Once tuned properly with the right size on the modified Bidalot exhaust I should be able to reach close to 13,500 rpm. After I’m done searching and modifying pipes, I will probably send all the dimensions to a special shop to build a custom exhaust. On the videos you’ll notice that the bike is not tuned yet. I didn’t have time that day to jet the carb for the new pipe or do any variator + engine spring tuning but it’s good to keep it rich for now. Those french mopeds with single variator + clutch pulley properly tuned have pretty fast take offs and would probably match any Derbi with the same engine size. I can’t imaging doing some extreme porting with an h20 80cc kit on a french bike. Plus, they’re much more fun to ride having manual control of the variator gearing ratio with the launch lever that gives you the feel of downshifting on an automatic transmission. Derbis or Hobbits acceleration feels more like a scooter, it’s fast but not as fun. With the french bikes you really feel like you have some control of the engine and the transmission belt, it’s amazing. There’s nothing like it. la vraie seule et unique machine de ce type qui fonctionne aux USA. 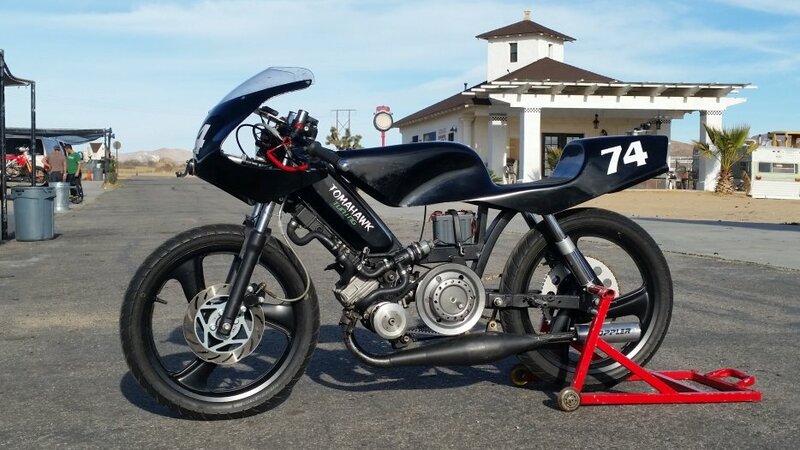 Probably a unique true french 50cc race bike in the US that actually works and race track ready. Daggrs Gr1 project, c’est parti! Puch e50 top tank 70cc Kstar kit done. Estoril exhaust custom straight baffle. Frame + wheels powder coated, tank custom paint by Ornemental Conifer. The only one in the US. Peugeot 103 dual variated Polini 50cc by Tomahawk. YouTube video: Motobecane av10 new Doppler 50cc kit 1st start. 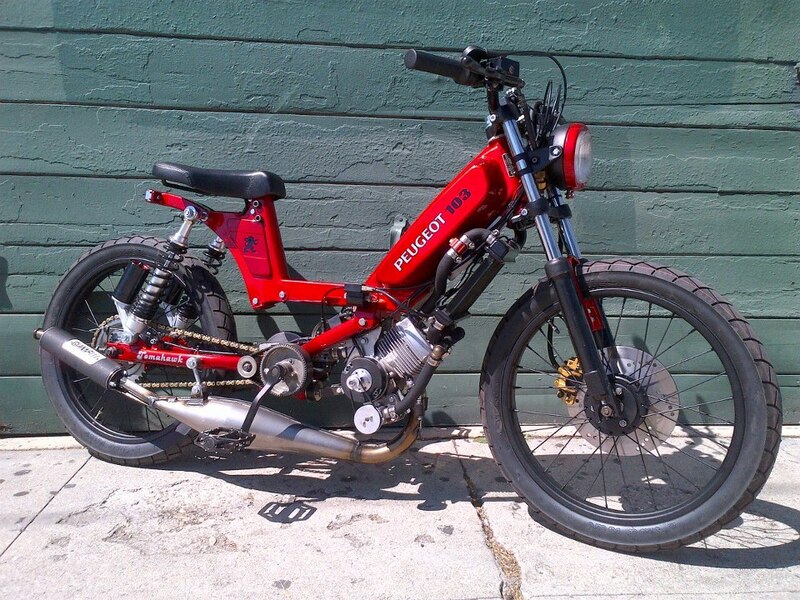 Motobecane 40T Doppler 50cc SOLD! Puch maxi 74cc by Shaw SOLD! Peugeot 103 polini 70cc SOLD! Peugeot 103 malossi 65cc SOLD! Cafe Peugeot 103 50cc SOLD!